High powered HF, VHF and UHF LPDAs are directional log-periodic dipole arrays primarily designed for EW and jamming applications. Power handling up to kilowatts with LPDA gains of 6 dBi, or a 80° - 100° H-Plane beam width are typical. 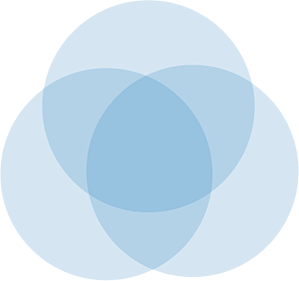 Polarisation is adjustable between vertical and horizontal without lowering of masts on some units. Wideband monopole antennas covers the frequency range of 1 MHz to 30 MHz at an input power of 1000 W. The antenna patterns are omni-directional, making it ideal for wideband jamming applications such as improvised explosive device (IED) suppression. Constructed entirely from corrosion-resistant materials and specified over a wide operating temperature range: -30 deg C to +55 deg C.
Get maximum power down range with these high EIRP log periodics that handle lots of power and focus it effectively. 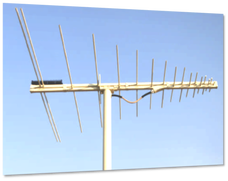 Pump up to killowatts through omni-directional high-powered EW antennas that operate in HF, VHF and UHF frequency bands. 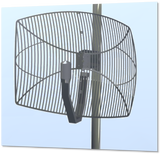 High power broadband antennas designed for jamming applications range from 88 to 6000 MHz. 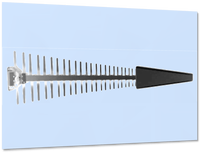 Omnidirectional antennas have excellent radiation pattern, no pattern break-up, and a consistently low VSWR across the entire frequency band. Full rated power is handled continuously at all frequencies, ideal for all 100% duty-cycle applications. A sampling of OMNIs are presented here, many others are available. Please contact us to discuss your needs. These high gain reflector antennas are designed for high power transmit applications where delivering power in a narrow beam with low backlobes is paramount.. Polarization is adjustable between vertical and horizontal via the mounting bracket. Covers all cellular and 2.45 GHz WiFi bands.